Students perform experiments centered on light waves and the way they interact with different objects and media. Through experimentation and data collection, students learn about the relationship between a wave and its medium, and how wavelengths affect the perception of light. Explore the reciprocal relationship between absorbance and transmittance of light in transparent substances. Understand the relationship between the shade or concentration of a color and absorption and transmission of light. Students are introduced to a new tool from the Procedural Toolbox, the use and operation of a spectrophotometer. Apply the use of the best-fit line tool from the Procedural Toolbox to create and use a concentration curve to determine the concentration of a solute in a solution. Introduction to two ways in which light interacts with a medium or object, reflection and refraction. Investigate the Law of Reflection. Gain experience in measuring angles of incidence and reflection. Explore how absorption, transmission and reflection of different wavelengths of light affects the way in which they perceive the color of objects. Students will be taught a new tool in their Procedural Toolbox, determination of an absorbance spectra. 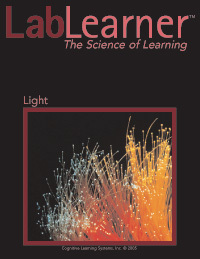 Explore the behavior of light waves as they enter and exit different mediums including acrylic, air, water and oil. Learn how to measure angles of incidence and angles of refraction and to use Snells’ Law to calculate the index of refraction of various media. Develop a better understand the relationship between the index of refraction and the extent to which light is refracted by a medium.